Lamont-Brown also argues that the motivation of the kamikaze pilots was still alive when three terrorists in the Japanese Red Army murdered 26 passengers and wounded about 80 others in the Tel Aviv airport in May 1972. Although the term "suicide bomber" may be a technically correct term for both kamikaze pilots and modern-day suicide terrorists, the spirit of kamikaze pilots and the motivation of modern-day terrorists differ radically. The kamikaze of World War II did not target innocent civilians. The book mentions the more reasonable view of French historian Jean Baechler, who "saw the kamikaze of WWII not as suicides for 'patriotic or romantic exultation' but purely as conducting a military technique" (p. 8). In other words, just as Americans used incendiary and atomic bombs to win the war against Japan, the Japanese military leaders employed suicide attacks as their best hope in combating the Americans. Due to the loss of experienced pilots, some Japanese leaders and pilots thought that their best chance to inflict damage on enemy ships was to guide planes into them rather than try to bomb or torpedo them and then escape. In 1944 prior to the start of kamikaze attacks, Japanese pilots suffered staggering losses during conventional aerial attacks, so Japan's military leaders tried to formulate a more effective strategy in the final stages of the war. The author makes an unfair comparison between the kamikaze of World War II and the three Japanese Red Army members who killed many civilians in Tel Aviv in 1972. Although these terrorists were Japanese, the Popular Front for the Liberation of Palestine recruited them. Also, the Japanese Red Army had an extremely small following, so no conclusion about kamikaze pilots should be made based on the terrorist actions of three members of an extremist group with very few members. After the book's provoking prologue, about half the chapters provide a chronological history of Japan's kamikaze operations, and the other half deal with special topics such as the battleship Yamato, the ōka glider bomb, and four types of ocean kamikaze. One chapter covers the British experience with kamikaze. Although Kamikaze: Japan's Suicide Samurai contains much interesting information, some of the book's features and arrangement make it a struggle to get through. 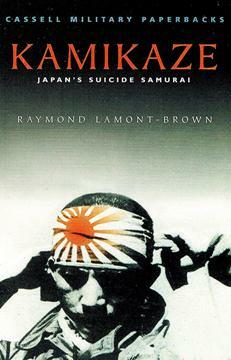 Unlike other English-language books on kamikaze, the author uses numerous Japanese terms and military ranks throughout the book. Although a five-page glossary provides definitions for Japanese terms, most readers will have difficulty remembering the many Navy and Army ranks. The author should have excluded certain chapters not directly related to the book's main topic, such as one chapter on balloons with attached bombs launched from Japan in the hope of reaching the U.S. west coast. Also, Chapter 17 on "Portraits of the Kamikaze" has brief biographical details on several men who were not even kamikaze pilots. The book also includes some detail lists that will interest very few readers, such as a one-page listing of the missions of the Divine Thunderbolt Corps (p. 120). Although this book covers the basic history of Japan's kamikaze attacks, other books (e.g., The Divine Wind by Inoguchi and Nakajima, Kamikazes by Rice, The Sacred Warriors by Warner and Warner) tell the story with a more organized and documented approach.